Standing Rock, ND — Over the last several months, the world has watched the American police state in action as cops from more than a dozen states beat, gassed, pepper sprayed, tasered, shot, and severely injured water protectors and protesters in North Dakota. Using their militarized gear, police have blinded at least one person and blown up the arm of another. With all the heavily armed police and military in the area, one would think that having a missile launcher would be entirely unnecessary — however, one would be wrong. Jon Zeigler has been live streaming from DAPL since last year. On Monday, he found something quite disturbing — the Avenger AN/TWQ-1 Air Defense System. Knowing their history of brutality over the last several months, the idea that police and national guard have an actual missile launcher at their disposal is nothing short of bone-chilling. According to the Army Recognition website, the Avenger AN/TWQ-1 Air Defense System vehicle is a missile mounted system which provides mobile, short-range air defense protection for ground units against cruise missiles, unmanned aerial vehicles, low-flying fixed-wing aircraft, and helicopters. Yes, there have been people filming the area with drones. However, there have been zero reports of police or anyone else being injured by a drone. It is also inconceivable to think that police would fire a missile to take down an amateur drone with hundreds of innocent people below. 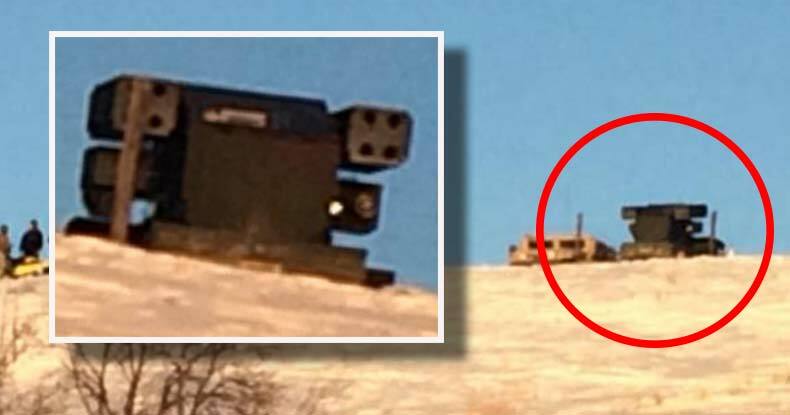 According to Ziegler, the missile system is on top of a hill guarding the DAPL drill pad. When water protectors attempted to ask police about the missile system, they were reportedly met with mace. Also, as the Free Thought Project reported in October, the Federal Aviation Administration (FAA) has restricted flights, and banned the use of drones within a radius of about 4 ½ miles of Cannon Ball. Whether or not the AN/TWQ-1 is there to enforce a no-fly zone has yet to be confirmed. If the National Gaurd needed the humvee to bring troops into the area, the AN/TWQ-1 is hardly effective as it only seats two people. This vehicle was specifically selected and deployed to Standing Rock. Its presence cannot be discounted or overlooked. Please share this story with your friends and family so that they may see for themselves the ridiculous nature of the police state response to people protecting water.